It started raining Sunday night. It’s still raining. Today is Thursday just in case you weren’t sure. We’ve dumped eight inches out of the rain gauge so far. It is supposed to turn to snow tonight. I’m not sure that will help the situation. The town of Murphy had a bridge wash out, and they are experiencing water and sewer problems. The river that runs through town was out of its banks yesterday along the park. The main road through the Smokey Mountain National Park is closed due to a mudslide that took out part of the road. Another popular touristy, scenic road, the Cherohala Skyway is also closed as of today due to a mudslide. They are saying at least two months before it reopens. 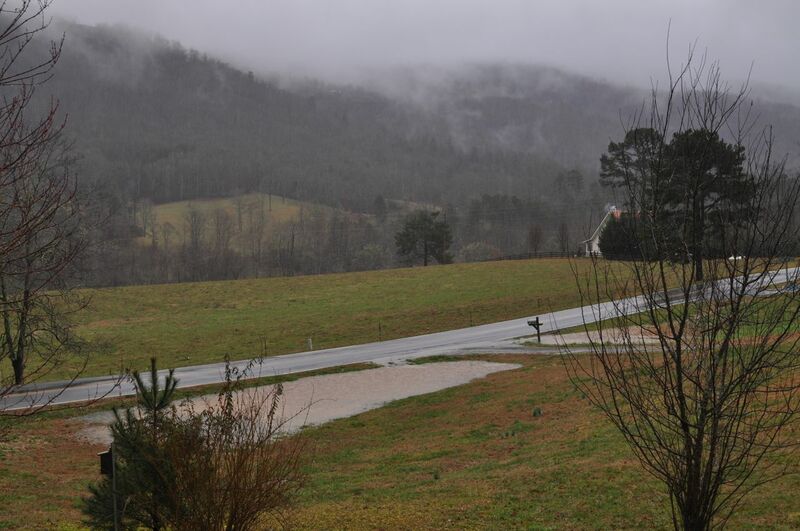 All in all there have been over 50 mudslides in the four counties in Western North Carolina in the last couple of days, many washing out roads. Things drain pretty well around here, but we do have a small lake in our yard. But if it were actually cold, at about a 10 to 1 ratio of snow to rain, that would be several feet of snow. My recovery from surgery has gone fairly well. Be glad to be back to full strength soon. Wow-we need rain, but I don’t want that much. Sorry to hear about your surgery–didn’t know about it until it was over. Hang in there! Thanks. Doing much better, but still taking it slow. Still probably several weeks from being fully recovered.